In today’s fast-paced business world, making rapid, data-driven decisions is crucial to maintaining a competitive edge. These decisions are especially important for Intel’s supply chain, which spans order taking, resource procurement, manufacturing, testing, and final delivery of products. 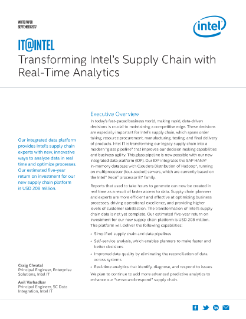 Intel IT is transforming our legacy supply chain into a modern “glass pipeline” that improves our decision ...making capabilities and business agility. This glass pipeline is now possible with our new integrated data platform (IDP). Our IDP integrates the SAP HANA* in-memory database with Cloudera Distribution of Hadoop*, running on multiprocessor (four-socket) servers, which are currently based on the Intel® Xeon® processor E7 family.